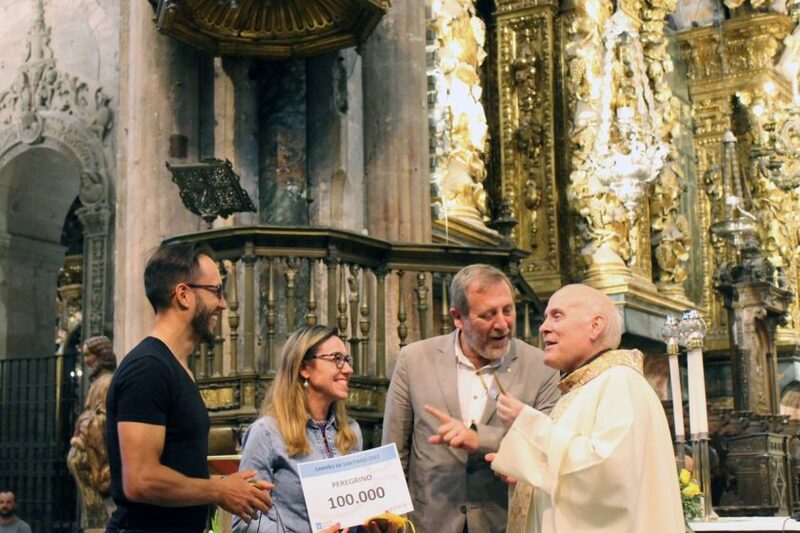 The 100,000th pilgrim to complete the Way of St. James in 2017 reached Compostela today and was welcomed at the end of the journey by the Santiago Cathedral Chapter, headed by Dean Segundo Pérez, along with Xacobeo Manager Rafael Sánchez, representing Turismo de Galicia. The pilgrims who marked the achievement of this symbolic figure were Juliana Pivato and Eliezer Ribeiro Antunes Junior, a Brazilian couple who completed the pilgrimage by bicycle, taking the French Route from Saint-Jean-Pied-de-Port. After collecting their Compostela, they were welcomed to the shrine of the Apostle at the evening Pilgrim Mass, where they were congratulated and honoured with various mementos. This milestone, which came earlier than in previous years, once again confirms the vitality of the Way of St. James. As we approach the end of the first half of the year, arrivals are around 12% higher than during the same period in 2016, at the end of which the pilgrimage route beat its absolute record for pilgrims, with 277,854 Compostelas being issued by the Pilgrim Office, located in the new International Pilgrim Welcome Centre. This is one of the main infrastructure elements which Turismo de Galicia, in partnership with Santiago Cathedral, has created in order to meet the current needs of the pilgrimage route set out in the Way of St. James Master Plan. In the first six months of 2017, 65% of the pilgrims who reached Compostela came from abroad, compared to 35% from Spain, with Germany, Italy, the United States and Portugal being among the most notable countries of origin. The top fifteen nationalities found on the Way of St. James represent five of the seven continents. They include France, Ireland, the United Kingdom, the Netherlands and Poland for Europe; Brazil for South America; Canada and Mexico for North America; Korea for Asia; and Australia. This is another sign of the strong international presence of the Way of St. James. Although 60% of pilgrims continue to choose the French Route to make their way to Compostela, other options – such as the Portuguese Route; the North and Primitive routes, both added to the World Heritage List in 2015; the Vía de la Plata; the English Route and the Portuguese Coastal Route – are growing in importance. The Xunta de Galicia is working to improve signage and the available infrastructure on all of these routes, among other initiatives. Next Post:What is the Bono Iacobus?